I've never considered myself an artist. But I like the freedom digital imagery gives us to play with photos. I have a darkroom at home, but it has been years since I worked with it. Today's photo software blow anything we used to do in the darkroom out of the water. 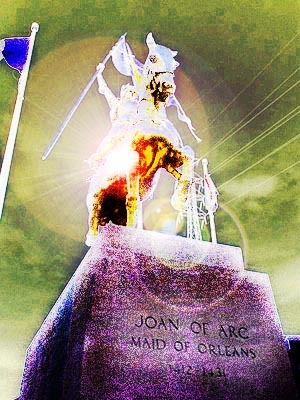 I took this photo of a statue of Joan of Arc near the French Market in New Orleans. In 35 mm, it would have been a snapshot that sat in my drawer. With digital photography, it has become an interesting and surreal image that I think is pretty darn interesting. Oh well, it amuses me. This is very cool. It gives your Joan de' Arc an ethereal quality. I could see this on a music album cover (er... "CD"). I anxiously await your next piece. YES...it is art.